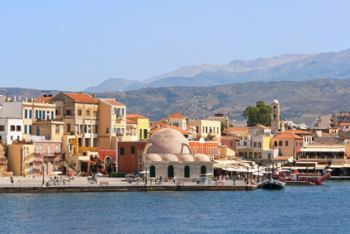 One of Crete’s main attractions is the beautiful old town of Chania with its Venetian Harbour lined with cafes and restaurants, and winding cobbled alleyways. 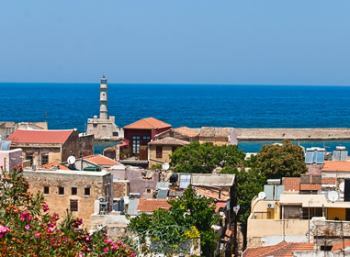 Steeped in history, Chania stands on the ancient site of Kydonia which flourished during the Roman period, and later became the capital city of the Cretan State (1897 to 1913). The harbour was built by the Venetians between 1320 and 1356. It was used for commerce and also as a fortification against pirate attacks. On its north side the harbour is protected by a breakwater. The Firkas Fortress at the harbour entrance and the St Nicholas bastion in the middle of the breakwater defended the harbour from raiders. The lighthouse is a distinctive feature of the harbour. It was built at the harbour entrance by the Venetians and restored in its present form by the Egyptians (1830-1840). Take time to explore the back alleyways, you’ll be amazed at the gems you’ll discover: beautiful old Venetian buildings with courtyard cafes and cozy restaurants, Cretan handicraft shops, boot makers on the Leather Street, and rows of shops selling hand carved Cretan knives at the Stivanadika. Stroll eastwards around the harbour past the multitude of fishing boats, yachts and pleasure boats; here the harbour front is lined with excellent fish tavernas. Continue right around and along the sea wall out to the beautiful renovated lighthouse the so distinctive feature of the harbour. You can also take a trip on a horse drawn carriage to give your feet a rest and explore out and beyond the harbour. From the airport get on the main road which leads to the center of the city. Entering in the city of Hania you will be on Eleytherioy Venizeloy Street which leads you to the centre of city, exactly in front of the municipal market (a building with an aerial view of a cross as it is presented in maps). You will find yourself on Hatzimihali Giannari Street. Still moving ahead you will come across Skalidi Street, a few meters down. From Skalidi Street, turn right at Piraeus Street (passing Champion super market). Leading up to the end of the road you will find yourself directly in front of the sea (Akti Kanari) turn right in order to find approx. 50m the municipal parking area Talos. From the car park to Theotokopoyloy Street is approx. 150m walking distance, where you will turn right, passing under one stone arch and turning immediately left, in 25m. you will find yourself exactly outside of the lodging. Road directions from Heraklion - Rethymno. Driving westwards on the national road Rethymno – Hania you come off at the exit Moyrnies – General Hospital Hania, turning right for the city of Hania. On the way you will pass two super markets (Lidl on your right and Champion on your left). Continuing your way, straight ahead to the city and in a distance of approximately 2kms you will reach the centre of the city where you see the municipal market of Hania (a building with an aerial view of a cross as it is presented in maps). As you arrive at the traffic lights opposite the municipal market (on the corner there is a coffee shop), turn left and you will find yourself on Hatzimihali Giannari Street. Still moving ahead you will come across Skalidi Street, a few meters down. From Souda harbour get on the road which leads to the center of Hania. Entering in the city of Hania you will be found on Nearhou Street. Moving straight ahead you will be on Tzanakaki Street, a busy part of Hania full of stores, coffee shops, etc. on both sides). that leads to the centre of city front from the municipal market (a building with ground plan of cross as is presented in the maps). will find yourself on Hatzimihali Giannari Street. Still moving ahead you will come across Skalidi Street, a few meters down. Because the particular character of the enchanting city of Hania, parking space is limited regionally in the area around the Venetian Harbour. For your best convenience, in case you approach the lodging with a rented car, please ask for a map of Hania at any rental office and follow the directions carefully. If it is required somebody from the lodging will be able to help with your luggage from the car park. If you arrive by taxi, we inform you that it is possible for the driver to drop you off exactly in front of the main entrance of the lodging, if you arrive before 11 p.m. For arrivals after 11:00 p.m. the taxi can leave you at the beginning of Theotokopoyloy Street, which is roughly 150 m from the lodging.